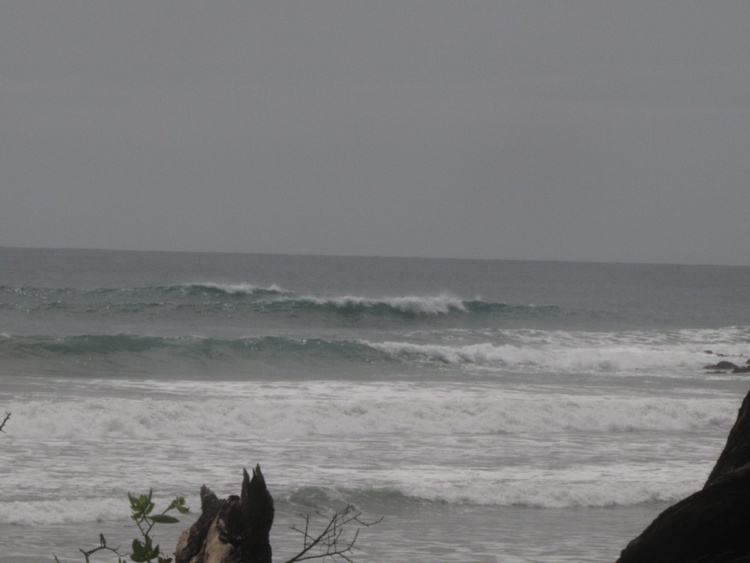 This past week, Aug 7th / Aug 14th, surf was good in Santa Teresa and nearby breaks. Conditions went a bit messy and unorganized at the beginning of the week, as the tail of the storm in Belize reached south into Costa Rica, bringing lots of water and some wind. Monday morning was pouring and waves turned chocolate from all the dirt washed in by the rain. Slowly the conditions started going back to normal and surf got very fun. Moderate SW swell filled in and waves were on the chest to head high range, growing a bit bigger for the weekend. Very fun waves rolled in at the beach break upfront Blue Surf Sanctuary Surf lessons Santa Teresa. Monday: Strong storm during the night and most of the day with lots of rain and lot of water washed into the beach. Morning conditions were windy and not favorable, however the surf cleaned up for the afternoon session and there were some fun small waves at the beach break upfront Blue Surf Sanctuary Surf lessons Santa Teresa. Tuesday: SW swell for mainly knee-chest high waves at exposures and shoulder high sets for top spots. Messy and unorganized conditions prevailed, with few nuggets sneaking in at the beach break. Wednesday:SW swell held in the knee-chest high zone for exposed spots, as better breaks hit shoulder high. New SW swell slowly creeping in during the afternoon. Thursday: More SW/SSW swell showed for waist-head high waves at good exposures, and better sets for top spots. Conditions were mostly messy and unorganized. Nevertheless, as usual at least a few good waves rolled in at the beach break upfront Blue Surf Sanctuary Surf lessons Santa Teresa. Friday: Modest swell rise and waves reached head high at exposed breaks. Fun steep walls at the beach break upfront Blue Surf Sanctuary Surf lessons Santa Teresa in the morning. Conditions were good early and again in the afternoon. Saturday: Good surfing at the beach break upfront Blue Surf Sanctuary Surf lessons Santa Teresa. Long rollers were sucking up on the inside. User friendly shoulder to head high waves were coming in very consistently.